Sharp Lines Old Times: For the love of curves. 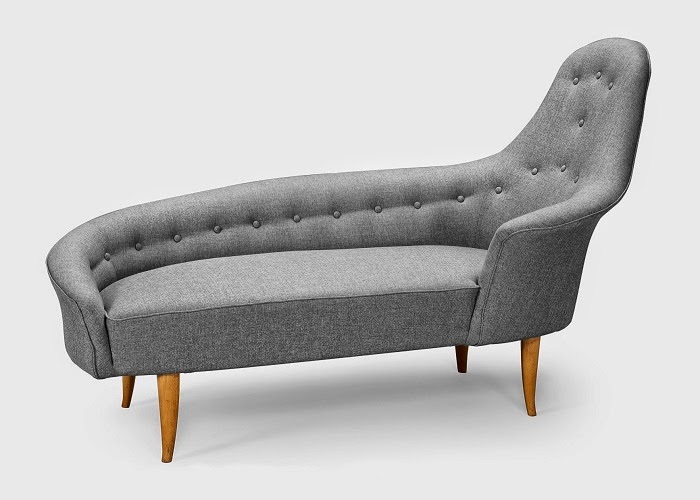 I love curvy, upholstered furniture from the late 1930’s up until the early 1950’s, especially those of Scandinavian origin. 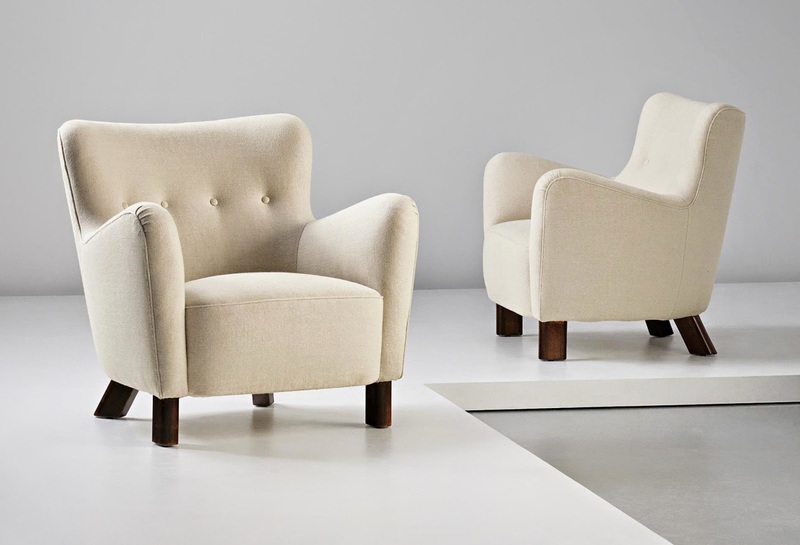 I've loved them for a long time and not just because these large, cozy and comfortable pieces have suddenly become highly sort after by serious design collectors, art galleries and interior decorators whose clients don’t mind spending $10-30.000 on a old Danish easy chair. 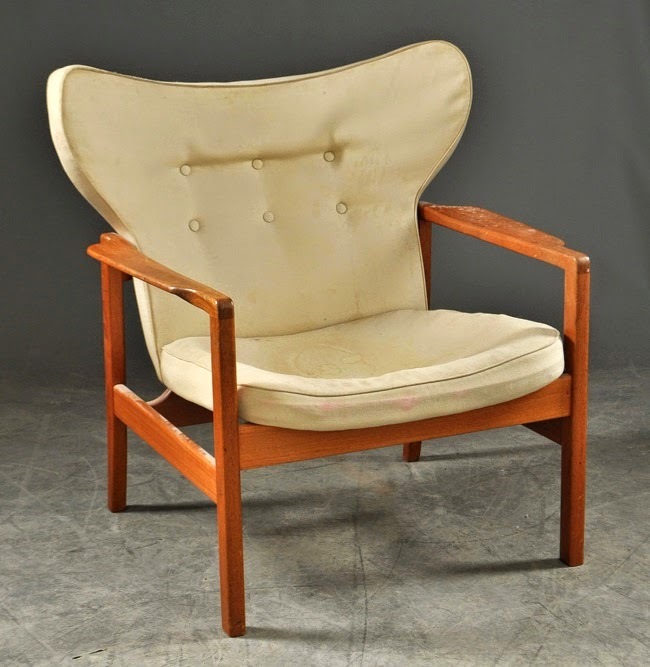 Or even $135.000 as was the case with a rare and completely original “The Tired Man” easy char chair designed by Danish architect Flemming Lassen in 1936 and sold at Bruun Rasmussen Auctioneers in December, 2013. Original photo of the 'Tired Man' easy chair upholstered in sheepskin (made by A.J. Iversen). 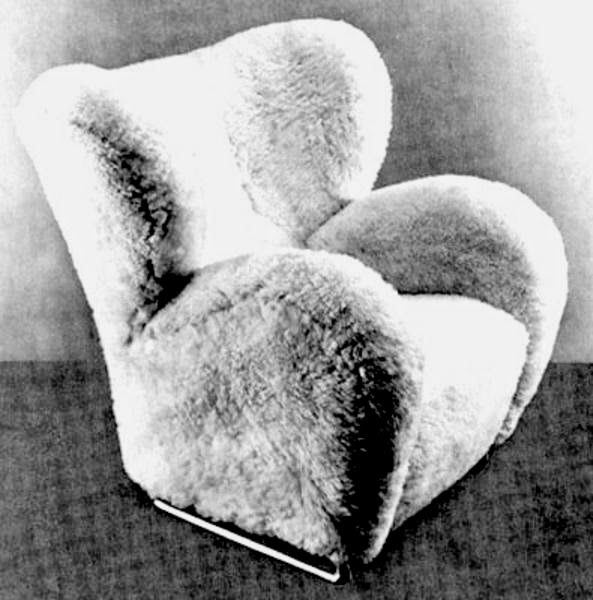 Flemming Lassen's intention with this huge chair was to make you sit "as warmly and securely as a polar bear cub in the arms of its mother in the midst of the ice cap". 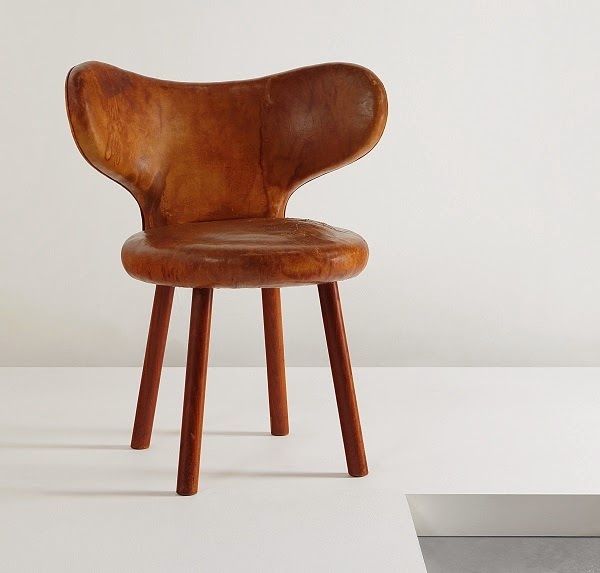 Due to the rarity of this chair (only 20-30 were ever made) I haven't tried sitting in it myself but by the sole look of it I'm quite sure the chair furfills Lassen's intention. 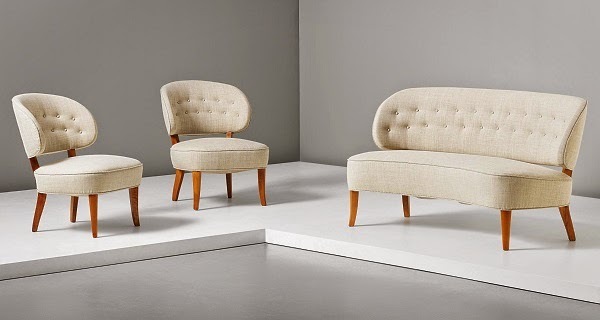 Unfortunately record-breaking sales like this also means that several particular chairs that could previously be bought through private Danish adds at no more than $300 are now virtually unattainable and will immediately be snatched up by dealers and sold at auction, simply because they have the right ‘look’. Nevertheless, let’s forget the money for a few minutes and look at the goods. I’ve picked examples of my favorite furniture pieces from the genre. 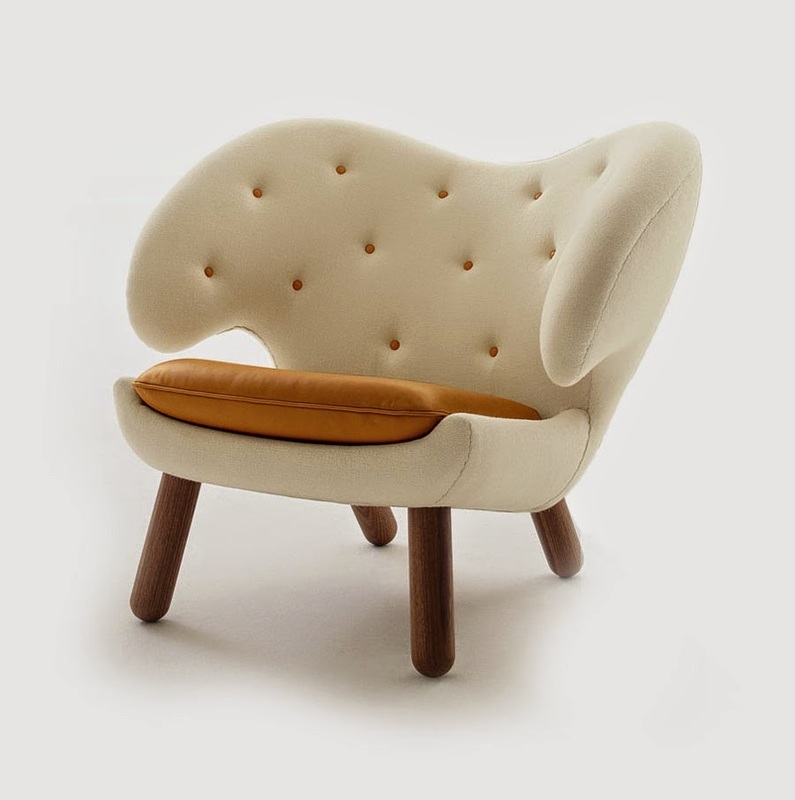 ‘Pelican’ chair designed by Danish architect Finn Juhl for cabinetmaker Niels Vodder (1940). – 2 in dark red fabric and 2 in black leather. for master cabinetmaker A. J. Iversen (1938). 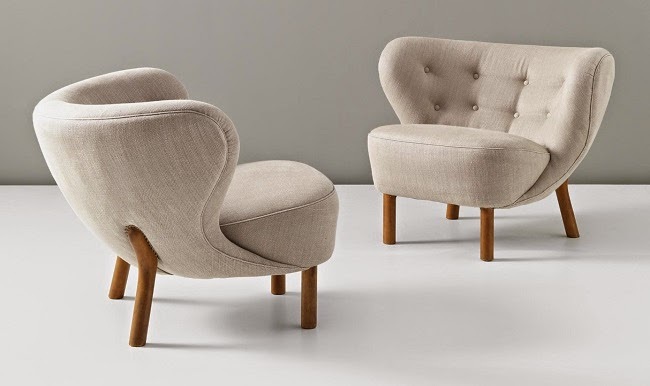 'Clam' chairs by Danish architect Philip Arctander for Nordisk Stål & Møbelcentral (c. 1944). 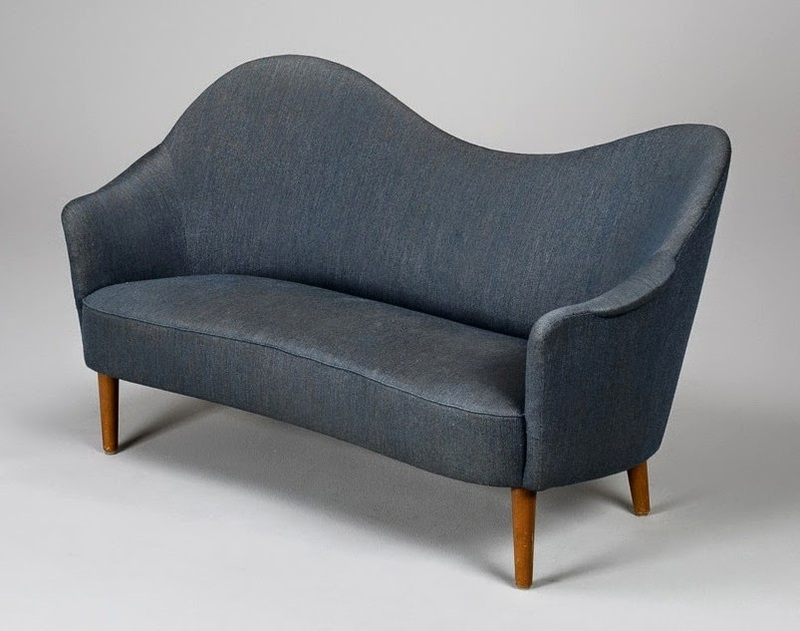 'Baker sofa' designed by Danish architect Finn Juhl for American company Baker Furniture (1951). Equally beautiful from the back! as part of her 'Paradiset' series for Nordiska Kompaniet (1958). 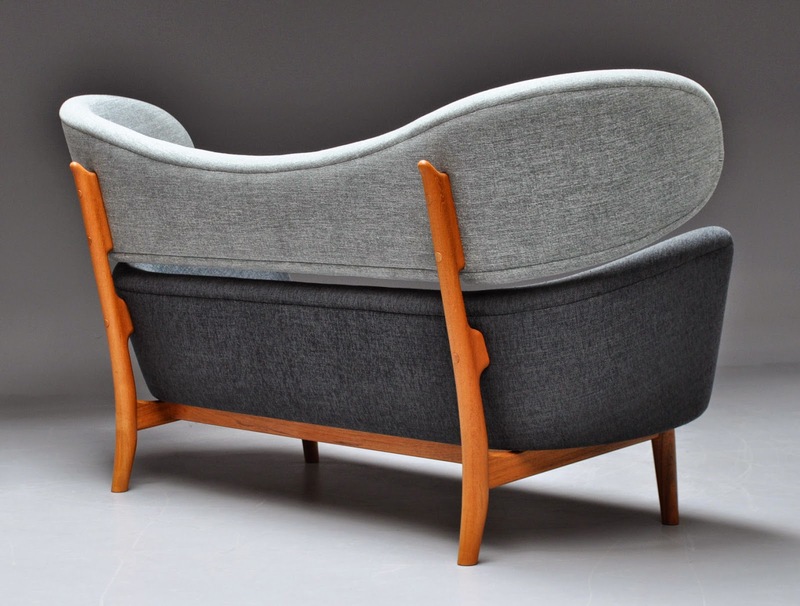 Settee by Swedish designer Elias Svedberg for Nordiska Kompaniet (c. 1947). 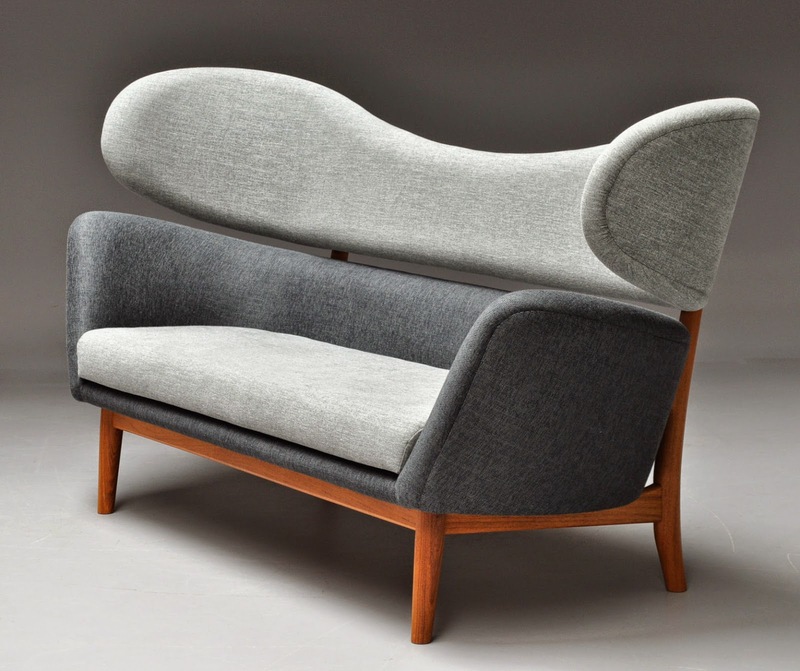 'Samspel' sofa designed by Swedish architect Carl Malmsten for O.H. Sjögren (late 1940s). 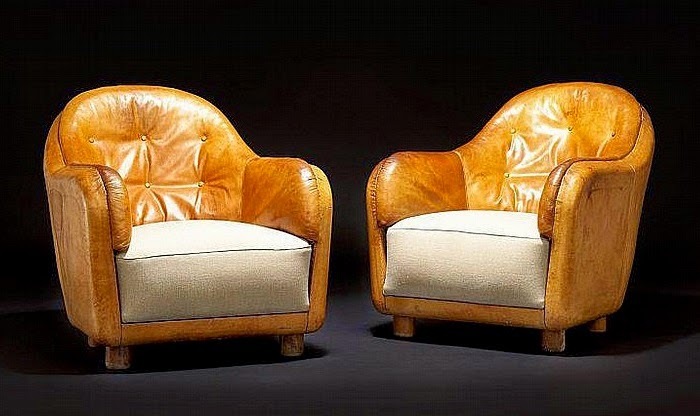 'Berlin' chairs and sofa by Swedish architect Carl Malmsten (c. 1946). Armchairs, model no. 1669, made by Fritz Hansen (1938). on the 'Augustus' transatlantic ocean liner. 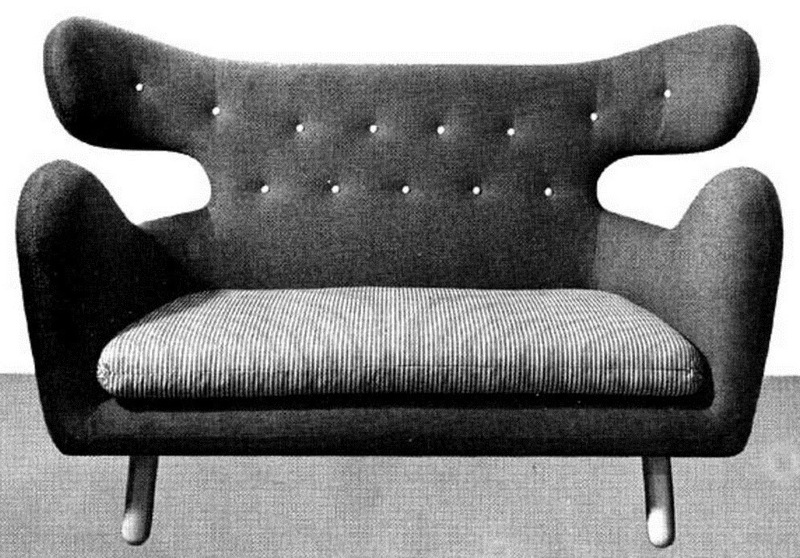 Made by Cassina (1950). Thorvald & Harald Petersen, the founders of Novo Therapeutic Laboratory, in 1935. 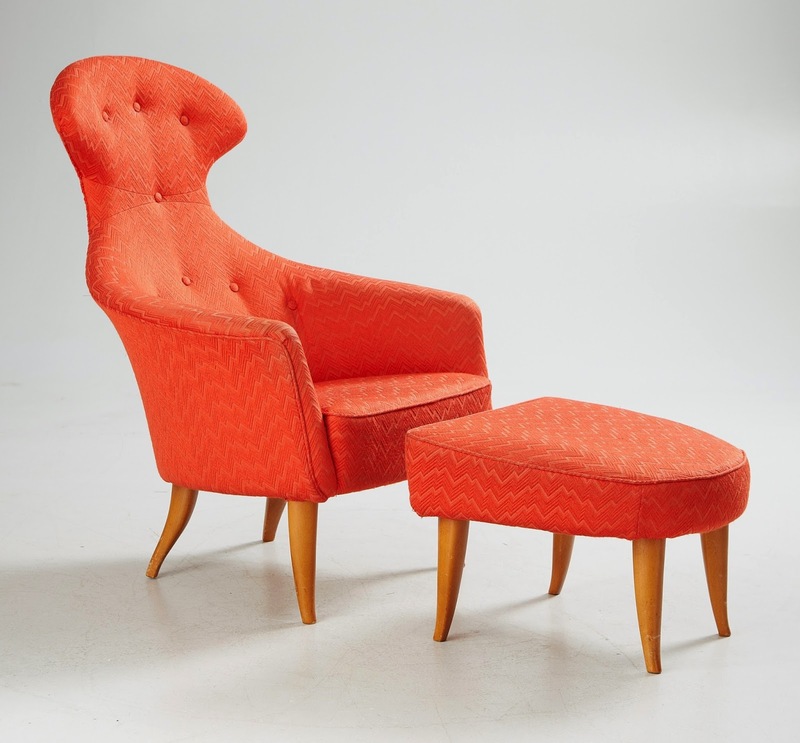 These chairs were originally part of a seating group which also included a third chair and a sofa. remains in the possession of the family after the founders of Novo. I would love to see that sofa! and made by master cabinetmaker A.J. Iversen (c. 1940). 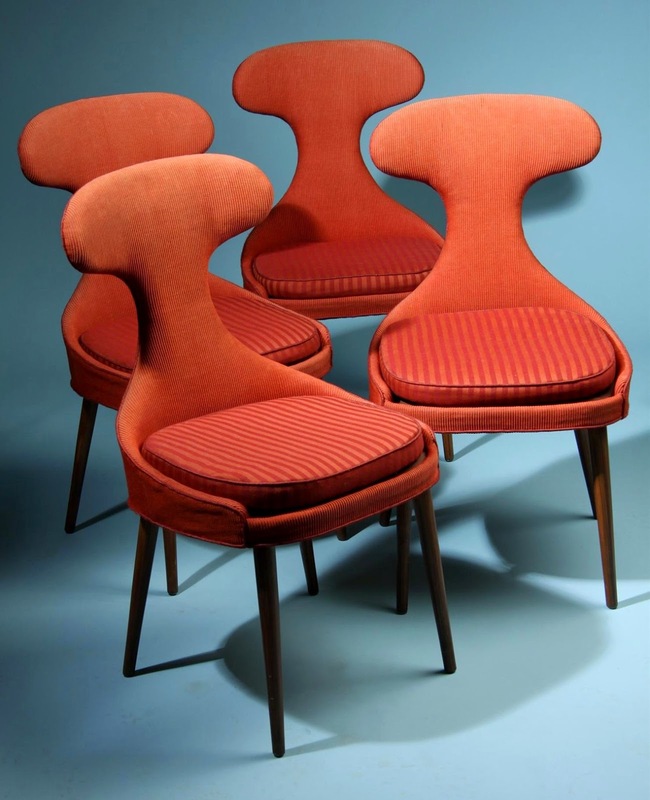 Set of dining chairs by unknown designer (likely of Scandinavian origin). 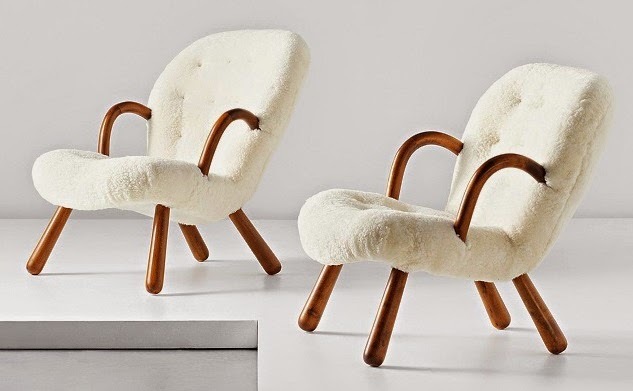 Extremely rare 'L’Ours Polaire' (aka 'Polar Bear') sofa created by French designer Jean Royére (c. 1952). 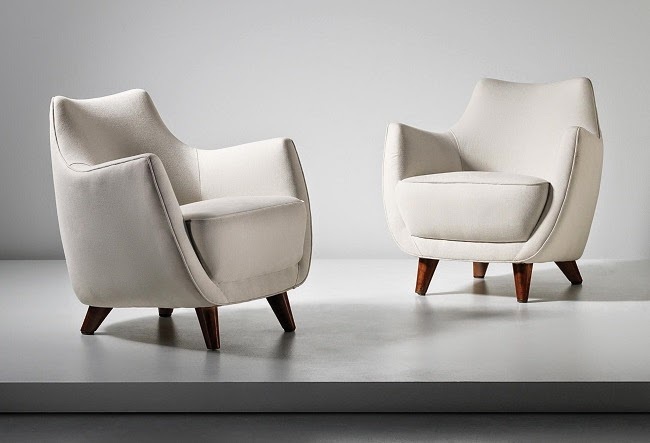 This is one of the most desirable pieces of modern furniture selling fetching up to $200.000 at auction! 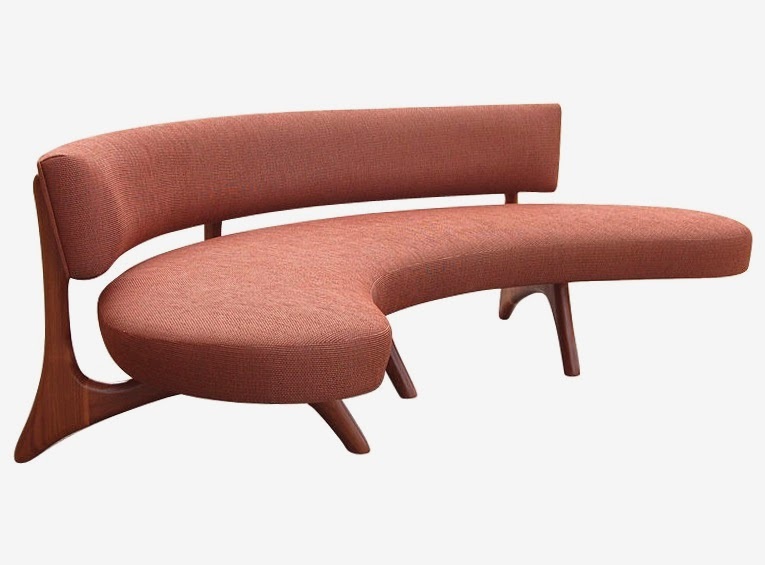 'Floating Curve' sofa by American architect Vladimir Kagan for Kagan-Dreyfuss Inc. (1952). 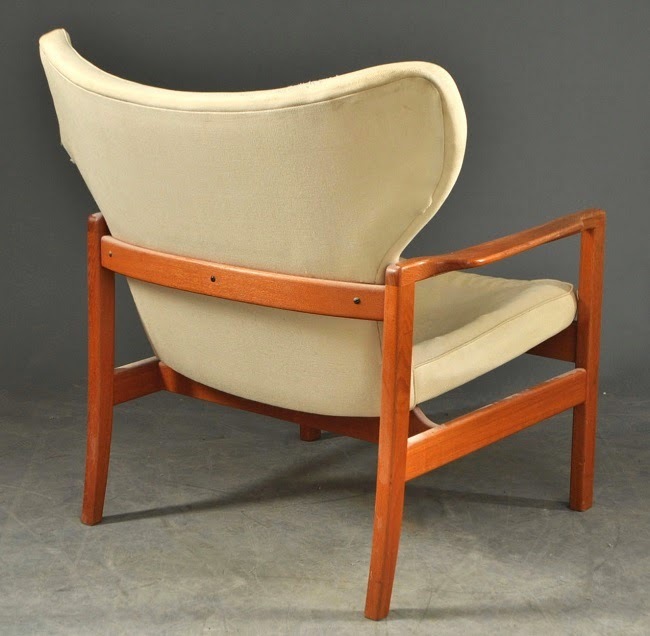 designed by Finn Juhl and made by Niles Vodder for the Cabinetmaker’s Guild exhibition in 1939. 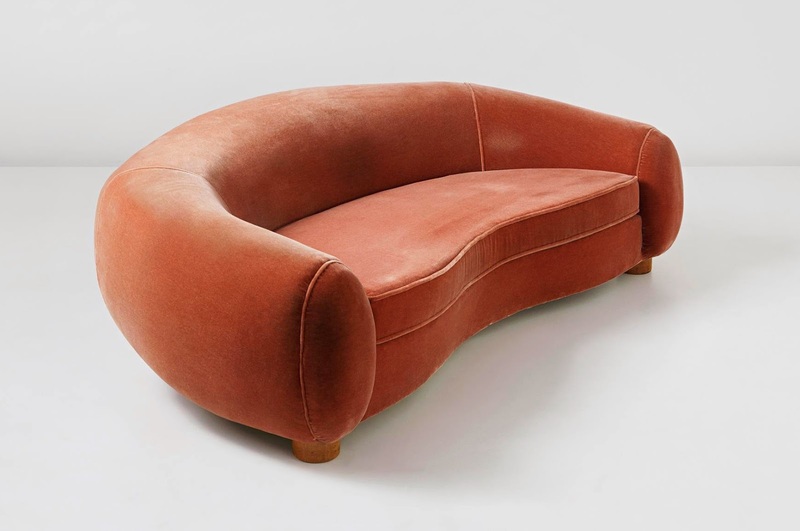 The first time I saw this weird looking sofa – probably in my early 20’s – I was literary shocked of just how downright awkward it looked. I shook my head in utter disapproval, not taking it the least seriously and actually thinking of it as being a complete joke. 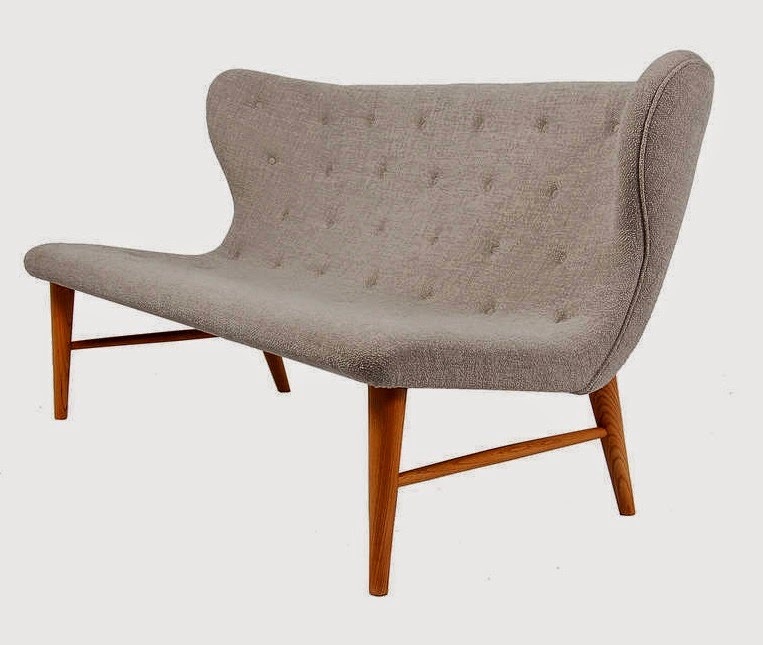 Furthermore I couldn’t get my head around why Finn Juhl – the creator of such elegant perfection like the NV45 chair – would create this clumsy monster of a sofa. Today, I absolutely love it for all the exact reasons that I originally hated it. Esthetically it’s still a mystery to me and so I’m continuously intrigued by its wonderful free-flowing lines and slightly unbalanced appearance. Whether this sofa still exist somewhere is anyone’s guess. 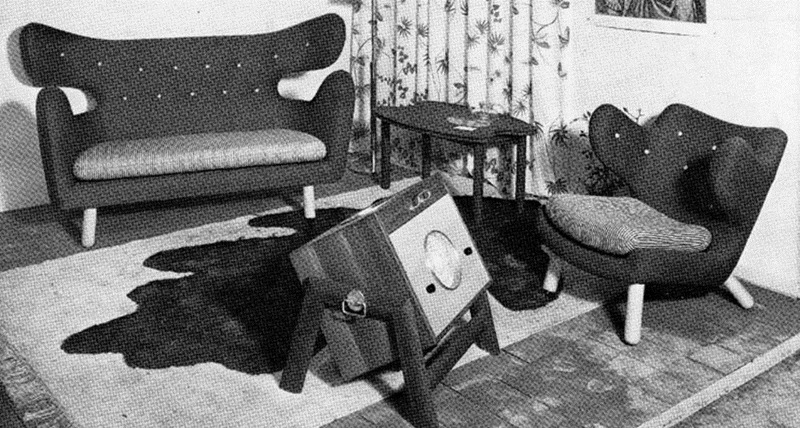 The same goes for the easy chair and the radio in the picture above. They all seem to have disappeared without any trace after the exhibition in 1939. There’s no doubt that should especially the sofa suddenly surface and be placed up for auction, it would probably break every sales record for a modern piece of furniture. I very much wanted a easy chair for my living room that somehow echoed the look of the furniture pieces shown above (especially since I can’t afford any of them). Though, as I really like wood, I wouldn’t mind finding a chair with a stronger presence of wood than just the typical small, choppy legs. 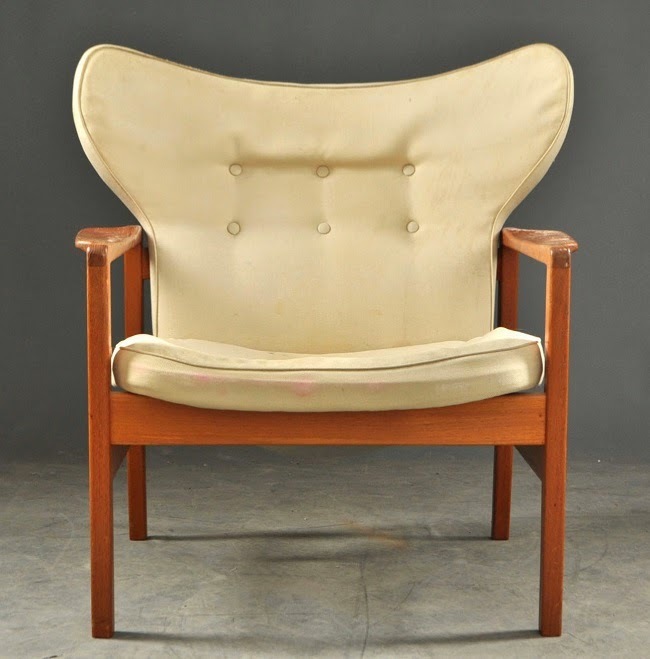 So what I perhaps really wanted - or dreaming of, to be precise - was a chair that had a softly curved seat with buttons so typical of the 1940’s but with a wooden frame pointing towards the more angular 1950’s. Yeah, a kind of hybrid chair caught between two different eras that however still share a lot of esthetical similarities. But hey, dreaming is the easy part - finding the right chair that somehow resembles what you’ve been imagining free of any restraints from the real world can take years. If it will ever happen. I browse through the Danish auction site, Lauritz.com, every day. Mostly just the categories for modern furniture and design. I seldom bid on anything as I mostly get my stuff elsewhere but it’s interesting to see the rare items that sometimes surface and what the market is willing to pay for them. A few weeks ago I stumbled across this chair on Lauritz. While the name of its designer or manufacturer was unknown, it definitely had the right lines. I immediately liked it. It was put up for auction at a showroom in Helsingborg, Sweden so not exactly within my immediate reach. From previously dealing with Lauritz personally I know that it is imperative to check whatever you’re interested in with your own eyes before buying through Lauritz. Their evaluation ‘experts’ are continuously horrible at describing their items accurately, especially in regards to condition. I’ve honestly lost numbers of times I’ve driven to their showrooms near and far from Copenhagen to look at a vase or bowl only to find out that it had a large chip or crack that was conveniently not visible in the pictures nor mentioned in the item description. So, it was with quite an uneasy feeling that I bad on the chair and fortunately won it (not cheap!). When it finally arrived at my doorstep I was happy to discover that while the seat itself is worn out beyond present usability - which I knew before I bid - the wooden frame has no damage in the form of nicks, cracks, loose joints etc. Just loads of dust and surface discoloration. I will eventually have the chair completely restored and I’m absolutely sure it will look fantastic. Hi Martin, this might be an old post, but anyways just to let you know the chair is made by my grandfather Magnus L. Stephensen the same designer who made the extremely rare wing chair.